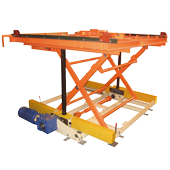 The Zip Chain Lifter is a new lift table that utilizes a zip chain that can be pushed and pulled. 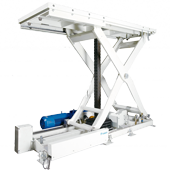 This groundbreaking, electrically driven lifting mechanism delivers twice the energy efficiency of conventional hydraulic lifters. At the same time, it also reduces time and enables high-speed, high- frequency operation and high stopping precision--factors that directly lead to improved productivity on the factory floor .